Today we’re off to Zipaquira, home of the famous salt cathedral. We’re generally not that excited by religious monuments, but this one is apparently a must do. The bus station is not surprisingly very busy and big, but there are enough official looking personnel to direct us to the right area. We’re immediately whisked onto a bus and then sit for a while as more passengers get on. We leave on what is apparently a ninety minute journey. For the longest time we crawl through Bogota traffic, seemingly stopping to load on more passengers every block. 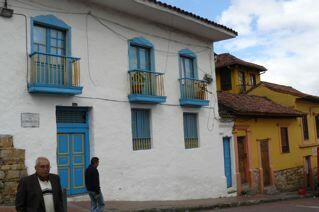 Unless the town of Zipaquira is hidden somewhere in downtown Bogota, we’ll never get off the bus in another hour and a half. This goes on and on, but afer a (long) while, we are out of the city and at last see the countryside. 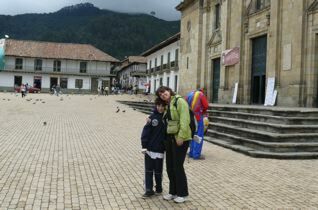 As I start seeing the signs for Zipaquira, Benjy, our son, and totally true to form, begins to feel sick. He’s a great traveller – engaged, interested, fun to be with, but his body is programmed to get sick on any foreign form of transport, and so in my mind the race is on to get to our destination before he loses it. We’ve learned the hard way to deal with our children getting sick on foreign soil, but it does change your perspective. Now instead of thinking of the day ahead, I’m thinking of the return journey. And I know my wife and son are too. We pull into Zipaquira not a moment too soon, and jump off the bus. At first, the town does not make the greatest impression. There is no bus station, just loads of busses coming and going on sidestreets everywhere. 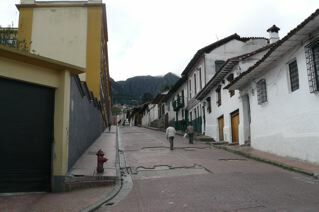 And the shops and streets are completely unmemorable and could be virtually anywhere in South and Central America. 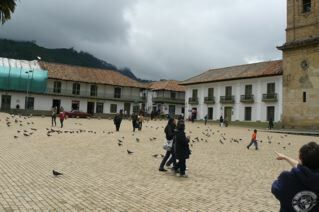 However, 100 meters up the road, we get to the central plaza and the older part of town, and Zipaquira announces itself as a gem. In fact, I’m surprised it only gets one page in my guidebook (Footprint) and that almost totally devoted to the cathedral. 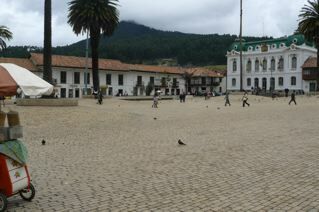 The square is huge and is surrounded by majestic buildings and some quaint shops. On the one side is a pedestrian shopping street selling just about everything although concentrating on mobile phones. It starts raining hard so we’re forced indoors. We go into a bakery type place and decide to sample some offerings. There’s no English so we don’t know what we’re buying but everything is absolutely awful. I insist on buying more pastries to taste but they’re worse. The pastries here – in Zipa, Bogota, Colombia – might be fabulous, but we’re not going to experience that today, so we go to the supermarket and buy a selection of yogurts and Kumis for lunch. We get a taxi to the salt cathedral, perched high on the mountainside and wait at the entrance. We have to join a tour – there’s apparently no individual walking around- but we’re assured it’s in English. Of course it turns out to be only in Spanish, and although we’ve enrolled in Spanish classes, those only start next week. So we’re understandably bored quickly, none more so than Benjy who is excited to run around but is completely stuck. If you travel with children, beware of tours: if it’s not appropriate (translate into ‘degree of boring’) for one or more of your children, at least one parent will spend the entire time trying to entertain or quieten their child, all the time looking at their watch desperately wanting the tour to end. I’m not saying tours are necessarily a bad thing – even if we don’t like them much – they can just be plain wrong for families. Oftentimes, you’ll get a richer experience by walking around on your own. Because children (and lots of grownups) have short attention spans, a tour can quickly turn off all attention. switches. This one is in Spanish, slow, and is apparently going into great detail about the stations of the cross, and for an english speaking Jewish family with a young child, that does not amount to a good equation. However after a while, Benjy is convinced we can escape the tour so we do, and now we can explore ! Now we see the place is extraordinary, with tunnel,caves, stairways all over and a fabulous place for a family to wander around. We spend a long time doing this, before finding the underground museum which strangely shows a 3D movie about robots. Outside it’s drizzling, so we get a taxi back to the bus area. To alleviate the real possibility of our child being sick on the bus back, we stock up on Colombian candies and cookies which take his mind off his stomach for a while. The trip back though seems quicker, as we find it always does when you have an idea of where you’re going. In Bogota, we get a taxi driver who speaks English and insists on giving us a mini tour of the city as he navigates his way to our hotel. He is super friendly and knows his stuff, and seems to just want to show some tourists a good time. When he drops us off, La Candalaria is buzzing and so are we from his friendliness and the wonderful general atmosphere of the Bogota streets. Benjy's pointing at something although who knows what ?